If you’re trying to decide on finishes for your new home (or just like to experiment with different combinations for fun), then check out the online design tool from New Home Ambassador. 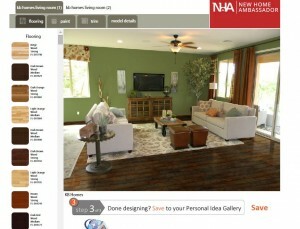 The Personal Design Home Visualizer allows you to try out different combinations of flooring, trim, paint colors, and more. Okay, we’ll admit this site is just a little addictive. But it’s a great way to decide whether the finishes you’re thinking about will actually work together, plus an opportunity to explore completely new ideas. When you’re done customizing, you can save your work and share it with family and friends for their input.